Outdoor Patio Furnitures – Patio is considered to be a great idea to have in the courtyard. If the weather is nice, patio lets you enjoy the beautiful blue sky along with the warm sunshine while you’re at home. It reduces your picnic expense. Not to mention, you can entertain your guests there supported by fabulous furniture. You can find outdoor patio furniture ideas here in this article. To choose furniture that suits best your patio, you have to consider the materials, styles, and of course, the cost. Don’t worry; you have so many options to choose from. 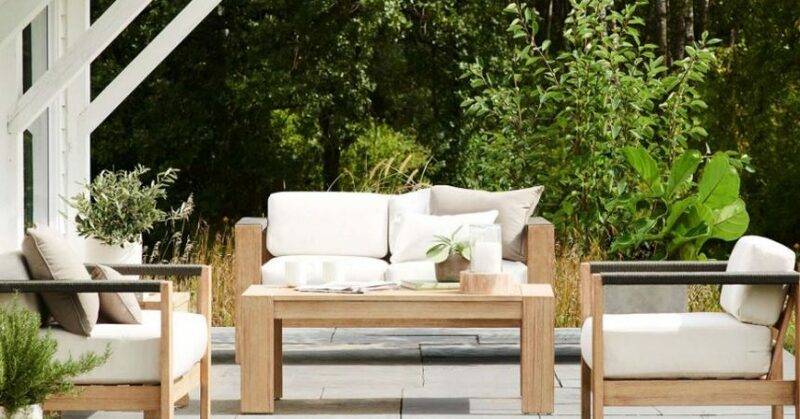 For a starter, decide whether you want to simply move the comfortable interior furniture outside or make your own definition of outdoor comfort instead. After that, choosing the materials comes next. Various materials are ready to be selected. From wicker to redwood, from iron to teak; that’s how varied the materials availability is. For traditional look and simplicity, consider wicker or bamboo. Meanwhile, cedar or redwood presents the substantial feel which also resists to decay, insects, and warping. For endurance under any kind of weather, stone or wrought iron works best. Consider furniture made of teak for poolside patio as the said materials highly resist to water. And if you’re not an easily bored person who are tend to like one thing for a long time, consider to have furniture based on powder coated metal material. It can last for many years without being faded or scratched. Now, after those considerations above, it’s time for you to take a look at these furniture models for some references and inspirations. Check the list below! To make your patio feel homier, you can put patio pillows and cushions with bright colors and patterns on the seater. Contrast them with the main furniture color for a good harmonization. Don’t forget to throw some intimacy by combining candles, flower arrangements, and hanging lights also to have the time with your spouse. The incorporation of larky colors, comfortable furniture, and pleasant plants like seen in the picture is also a part of bohemian design guidelines. So, if you like boho chic, you can apply the similar setting to have this adorable look. Since outdoor furniture more likely needs to be moved a lot because of the shade and the sun, you will need this clever idea: install casters to make it movable, especially table. The installation is an easy project which is able to be done in just one day. There are casters available with brakes, too, for you to have more control over the furniture. Now take a look at the pleasant sight of porch shown by the picture. We guarantee you’re confused to decide which element that pleases you more. Is it the cute coffee table? Or is it the stunning swing design? Or instead of the two elements mentioned, is it the colorful decorations of cushions, flower arrangements, and patterned floor covering? Well, just say all of them. This is called a roofless living room. How is it so? Because this open space is filled with sitting area, lighting arrangements, and completed with an exposed mantel brick fireplace in the corner, exactly just right like any living room indoor. It is a perfect place to have a gathering or simply to entertain your guests. This paver patio is complemented by tile flooring, two elements which are proven to be durable in any kind of weather. The wooden chairs and cream seat look perfect surrounding the round table. Nothing would best describe nature as this patio here. Just beware of the weather, viewers. Just wow. How do you define this picturesque outdoor living room? Because this article couldn’t find any other word than ‘wow’ for sure. From the top to bottom, from the shade provider oak tree which attains the age of 80 to the flagstone flooring; all of these create masterpiece! Don’t forget, the well-matched furniture needs to be mentioned, too. They come from the collection of Celerie Kemble’s Lane Venture in perfect moss green along with leaves patterned cushions. The absolute final touch is blue and red flowers above the tables which support the whole look. How come an outdoor living room be this lovely? It should not only weatherproof, but waterproof and chlorineproof also. Aside from metal based furniture that always is a safe option, rattan can be an alternative also. Rattan’s maintenance is pretty easy. Just wipe any wet part when it’s splashed and place it directly under the sun or anywhere with a lot of natural light exposure. Rattan is also light, so you will not have a problem with moving the furniture to reposition it. Or, you can consider installing casters to make the task easier. Rattan furniture like seen in the picture comes in a set and it’s just perfect. Two rattan lounge chairs along with rattan square table are nicely placed on top of plank wooden flooring. Now this one is called luxury, because it allows you to have the luxury of relaxing and enjoying the warm sunshine under white parasols. While the previous picture displays rattan based lounge chairs, these ones are wood based with soft cushions over them which lets you lies on comfortably. You can have patio in whatever your living place is, even if you live in an apartment. You can, of course, have gorgeous patio like people with pretty and spacey courtyard have, though it will not be as big as theirs. But don’t worry; small patio with the right furniture won’t be less beautiful from the bigger ones. The example is here in the picture above. The dwellers of this apartment have magically changed their small space in balcony into a stylish patio. You can certainly conclude that the dwellers love patterns, seen from the black and white patterned cushions as well as black and white stripes seats. Not to mention the stripes of green and white rug that goes along really well with the railing of the same shade. The highlight is the white tulips you see on top of the small coffee table in the middle. How beautiful. Some tips to have warm and comfortable look in your apartment patio based on this picture are one, place a small coffee table and couch, and then complement with wood impression flooring. And two, select not too flashy yet cool colors as the said shades are fancier to view. 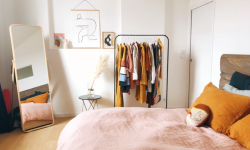 Several additional tips to apply are: do not leave the wall undecorated, add antique furniture, throw in some handmade crafts, consider using reusable decorations, select multifunctional furniture, and make use of some old items. This is another clever idea to have at your patio. The bench is multifunctional that can also be a storage for your patio cushions. As you might want to put some eye-catching fabrics which are not weatherproof as your patio decorations, you have to move them inside your house when it’s likely going to rain. Now, with this multifunctional bench, you don’t have to be bothered by the said task. Just put the cushions inside the bench and that’s done. This must be what the saying ‘kill two birds with one stone’ means. Less is more; many people agree with that. And that concept is also seen in the picture we have here. The simple dining set, consists of a square wooden table and four wooden chairs, is attractive because it’s arranged nicely in the corner of the patio. However, you can’t stop only mentioning the dining set without pointing the nifty cushions. They are what sweeten the whole set with their bright and nice colors of lime green and lemon yellow. All of things spoken are perfected with red hanging candles right above the table. Wicker is material made from strong vines and stems which are woven into complicated patterns. Aside from its light weight and airy quality, wicker also comes in various colors and designs which make this material perfect to be outdoor furniture. There are two kinds of wicker: synthetic and natural wicker. Each of them has pros and cons sides. Synthetic wicker is a bit more costly than natural one, but the former can be used for more things than the latter. ynthetic wicker is also resistance to outdoor disturbance due to its constituent elements of stainless aluminum and moistureproof resins. Meanwhile, natural wicker isn’t resistance to stain and moisture. The furniture you see in the picture is an example of synthetic wicker. The color selection is so classy. Brown wicker L-shape sofa and table are well matched with cream seat and patterned sofa cushions. Decorate the table with some sunflowers to complete the already nice view, and then it’s done. Traditional is all over the place. Dark brown wicker armchairs are ready to let you sit close to the unique fire pit above the table and enjoy the radiating warm in the middle of cold season. Be on your back to feel the softness and comfort the lovely red patterned cushions provide you. Less cold is guaranteed after such service. This classic patio is well designed by Imagine Backyard Living. The hidden message behind the name is to allow us imagine their work on people’s backyard through the living picture like the one we have here. Well, let them the professionals do more amazing jobs, mate, while you continue on benefitting their arts! Wrought-ironed or cast seating is indeed classic but still beautiful. It is said so due to its fantastic forms, such as the curved frames and latticework like seen in the picture. Black is an absolute color for furniture with the said material though there are several furnishings that come in other colors as well. There are two downsides from wrought iron material. One, it will rust if the finish is scratched or notched. But your furniture can last for many years outdoor if the painted finish is maintained in good condition. And two, wrought-ironed is surely heavy. You will need a lot of effort if you want them repositioned. This is another example of wrought-iron seating as your patio furniture. While the former picture displays a long oval table with six cushioned chairs, this one has a round table surrounded by four seats. You see, wrought iron only becomes more and more popular as people consider its beauty and durability. Compared to wooden furniture that needs high maintenance and plastic furniture which is often not satisfying, wrought iron is a great deal in terms of attractiveness and ability to last for a long time. Though it is pricier than those of wood and plastic, but the benefits it gives still worth the price. From the two descriptions above, it can be concluded that there are the pros and cons of wrought iron based furniture. They are as follows. So, I guess in building your own desk by following the tutorial of DIY plans, you need to follow it carefully. A desk is very crucial for your office space, especially the one at home. There are a lot of customized desk built you can purchase from the store but it’s not budget friendly. Wrought iron seating is hard and not cozy enough. You need some cushioning to do the job instead. The paint finish could get scratched and you need to touch it up. Wrought iron is heavy. You will require extra effort to move it. It is not as easily available as other material. Believe your eyes because they tell no lie. Yes, it’s a patio dining set with fire pit on the very own top of the table. This unbelievable set comes in seven pieces of one fire table and six chairs. Aside from those mentioned, lava rock, fire bowl cover, and seat cushions are also included. And, you can buy this set online, ladies and gentlemen. The chairs’ frames are made of durable steel which qualified to be outdoor furniture. You can have barbeque party with five more people seated along with you on the thick thus comfortable cushioned-seats. The cushions come in khaki tone which awesomely contrast the driftwood chairs.